The Bank of Ireland, in College Green, is decidedly the noblest specimen of architecture which the metropolis can boast; indeed, it is scarcely saying too much to assert that it is unequalled in grandeur of design, simplicity of arrangement, and majesty of effect by any public building in the empire. 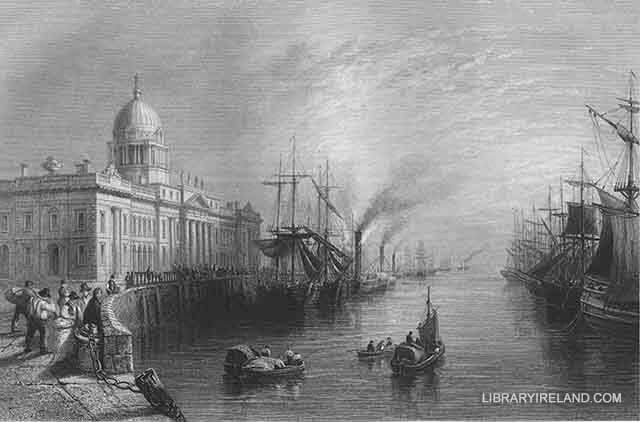 This magnificent pile was originally the parliament house of Ireland, but in the year 1802, after the incorporation of the Irish senate with that of England, by the union of the two countries, the building was purchased by the governors of the Bank of Ireland for a sum of nearly £40,000. The central facade and projecting wings, which form a colonnade of the Ionic order, are admitted to be a chef d'oeuvre of modern art. This noble portico, which is without any of the usual architectural decorations (with the exception of the three statues surmounting the centre pediment), derives all its beauty from the harmony of its proportions, and is one of the few instances of simple form only expressing true symmetry. On the conversion of this building into a bank, several alterations internally and externally were found necessary, to adapt it for its present purposes, which, however, have been executed with judicious taste, and a strict regard to the preservation of the original design of the edifice. About twenty years since these splendid warehouses were burned to the ground, and property to a great amount destroyed. The fire, it was imagined, was caused by the spontaneous combustion of some goods deposited in the building.